The Federal Reserve recently signaled a halt in the rate hikes, which effectively anchored front-end yields to their current spot. At the same time, longer-term yields declined, notably in the 1- to 10-year range, as investors concerned about Brexit and slowing global growth bid up bond prices. How can investors navigate these conflicting bond market signals? Here are a few ideas to consider, with easy implementation using exchange traded funds. 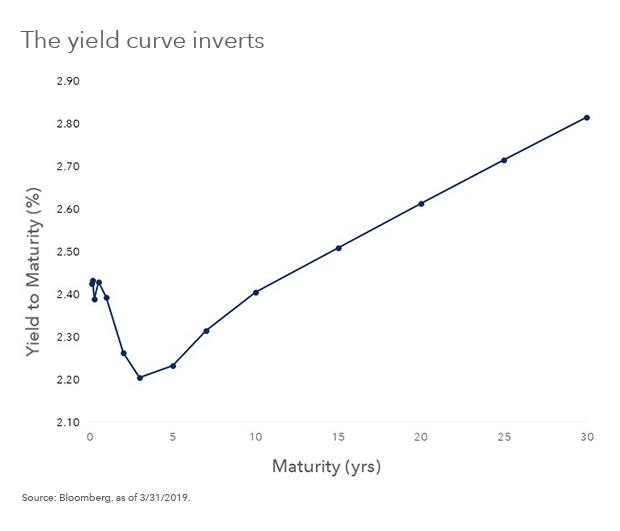 The yield curve, which plots Treasury yields across the maturity spectrum, serves as an indicator for the health of markets and the economy. A "normal" curve slopes upward from the short to long ends. Recently, the curve inverted to a "dipper" shape, with 3-month Treasury bills yielding more than 10-year Treasury bonds for the first time since 2007. What happened? The Federal Reserve recently signaled a halt in the rate hikes, which effectively anchored front-end yields to their current spot. At the same time, longer-term yields declined, notably in the 1- to 10-year range, as investors concerned about Brexit and slowing global growth bid up bond prices. (Bond yields and prices move in opposite directions.) The market even began to price in an interest rate cut, which has deepened the inversion even more. An inverted yield curve has often signaled a recession on the horizon. Is that what's about to happen? In other words, the corporate bond market is drawing a more favorable economic picture than the Treasury - a picture with few indications of recession. Go long the short end: Consider investing in short-maturity Treasury bonds. For example, the iShares Short Treasury Bond ETF (NASDAQ:SHV) and iShares Treasury Floating Rate Bond ETF (NYSEARCA:TFLO) can help provide similar yields to long-term Treasuries with less interest rate risk. Buy the bond market: Most investor portfolios are still overweight stocks, so adding some bonds could provide ballast if we enter recession. The iShares Core U.S. Aggregate Bond ETF (NYSEARCA:AGG) seeks to track the broad U.S. investment grade bond market (as defined by the Bloomberg Barclays U.S. Aggregate Bond Index), including Treasuries, mortgage-backed securities and corporate bonds. Go long on the longer end, too: Longer-term Treasuries often experience a flight-to-quality during periods of uncertainty, which cannot only boost their value, but could also hedge against a coming recession. The iShares 20+ Year Treasury Bond ETF (NASDAQ:TLT) and iShares U.S. Treasury Bond ETF (NYSE:GOVT) can both provide access to longer-term U.S. Treasury bonds. So what's the story? If the bond markets are indicating a recession, investors can take simple steps to help prepare their portfolios no matter what the ending.